Summer holiday rental, private villa from 700 century. 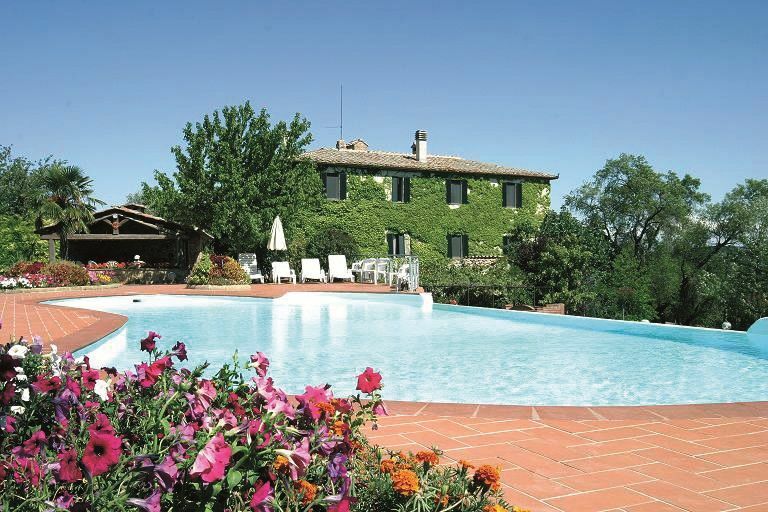 La Palazzina is a farmhouse in Tuscany with a beautiful swimming pool. The apartments for rent date back to the XVIIth century and have been lovingly restored. La Palazzina is immersed in the Tuscan countryside just 18 km South of Siena. We will be pleased to host you at any time throughout the year, in a 18th Century Manor house that has been converted into eight self-contained apartments. We rent the villa minimum for two nights. Eloise was a wonderful hostess, always there when we needed her. The property is comfortable, clean and a delight. We had plenty of room in our villa for the seven of us. Eloise made us breakfast as well as a sumptuous dinner one evening, which we ate al fresco. The vegetables came fresh from the garden. Delicious! And the 'house wine' was wonderful! If you plan to cook, you may want to bring along extra spices and seasonings as the kitchen is well equipped with dishes, pots and pans, but is a bit light on the spice rack. We ran out of a few things and Eloise was quick to bring us refills, including coffee one morning, which held us over until we could make it to the local market. Plenty of room to get out and about. The property itself is stunningly beautiful. The pool was still open (we were there in late September and early October) and while it was chilly, it was refreshing and provided a quiet place to relax in the sun. We walked about the property and a few other trails suggested by Eloise, meeting other travelers on their own walk about. Just 20 minutes south of Siena, there is much to do in the area. All in all, we had a delightful rest for seven days and nights. The night provided beautiful skies filled with stars. The days were mostly filled with sunshine and the fragrant scents of trailing flowers on the vine. This property is gorgeous and Eloise and Franco were such amazing hosts! Here is a summary of what we loved but you'll have to reserve a spot yourself in order to truly experience this amazing place. -Our hosts cooked for us one of the nights and it was delicious. Fresh meat and cheese tray, beef roast, wild boar, and dessert. All from product on their property. -Only 30 minute drive to Sienna and Montolcino. I recommend going to both of these spots. -Again I'll mention how wonderful the hosts were. So nice and accommodating. Both speak English in case you do not know Italian. Enjoy your stay - we certainly did!! Rustic charm and stunning landscapes in the heart of Tuscany. This a rustic but well maintained and beautifully landscaped property with stunning vistas of the Tuscan countryside. The hosts are charming and solicitous of their guests, and cook fabulous meals from their own garden and livestock. Well worth the trip. Property is beautiful. Lovely family. Clean and relaxing. Close to Siena and small towns. Large Villa does not have A/C but others do. Bring bug spray! The mosquitos are viscous and the local big spray does not work! Pool is amazing and the food she prepared was awesome! Thanks Eloise! Thank you very much! wish you all the best! We had a lovely stay here with family. A reunion of 11 people, and we fit nicely in the larger villa. The pool area is very nice, and the hosts are very gracious to allow families to swim at any hour. Meals can be arranged if desired. We chose to do this once (for the day we arrived only). There is a small grocery store 15 minutes away by car and the larger villa comes with a full kitchen so it was easier for us to cook for the family. Our host was also very helpful in providing recommendations for things to do in the area. You must have your own car to explore. We drove to Montalcino on a few occasions to have lunch or dinner. The wineries are everywhere but our favorites were the Mozart Winery and the Solaria Winery. Siena is about a 30 minute drive and worth seeing. All in all, a great spot for larger groups, and families. The hosts are very welcoming and the grounds are gorgeous, complete with their own garden, pool area, and lounging areas with beautiful Tuscan views. We love Tuscany and will certainly come again! thank you very much for your review. We really enjoy to meet nice peoples like you, we fell your energy . The home is exactly as advertised. The location is perfect to visit Siena, Florence, Pisa, and many other great locations. Eloise recommended several restaurants during our stay that were charming and very delicious homemade pasta. We accepted Eloise's offer to cook us dinner one evening and we were very happy with the wild boar ragu, homemade pasta with bolognese, homemade breads and apple pie! To accompany we also enjoyed the olive oil and chianti, both made on the farm - very scrumptious! Thank you very much for stay with us, you are a very nice family and was a pleasure to meet you, Thank you again for appreciate the dinner we made with a lot of love for our guests. For families, our farmhouse, is an ideal place, all the apartments are located near the pool and near all the other facilities and activities which are all at your disposal throughout the day. What is more pleasant than having a good meal outside with friends. Therefore we put a large and well equiped barbecue place at your disposal. We also organize in the evenings, events where you will be able to enjoy typical and delicious culinary specialities, have fun and find new friends. We organize also trips and excursions to the nearby hills, forests and rivers where you will admire the beauties of the Tuscan countryside. It is also possible to do this excursions later in the evening in order to discover nature and animals by night. Autumn in Tuscany is a season rich in colors and specially rich of funghi, type of mushroom, which forests are plenty of at that time of the year and are an essential part of the typical Tuscan cuisine. Guests will enjoy relaxing baths in the swimming pool.